Our Pay by API service lets you send mass payouts to over 200 countries — easily, securely and at very competitive rates. For businesses sending at least 1 million USD in annual payouts, our Pay by API service delivers an automated, scalable solution, with Transpay managing the entire end-to-end process. Customize integration of Transpay's API with your payouts processes. Payouts go through Transpay’s robust Compliance and FX engine. Recipients get local bank transfers via Transpay's Payout Network. Our flexible and powerful REST API typically takes between 2-4 weeks to integrate with your systems. During the process, a dedicated integration specialist works closely with you and your development team. Customized training is also available. Transpay manages all transactions from start to end. Simplify your global payouts by leveraging our more than 8 billion USD in purchasing power, and in-house expertise in Liquidity Management and Compliance. Our internal compliance team ensures every transaction meets AML, CTF, KYC, and other governmental regulations in the US and other countries we serve. Working 24/7, our dedicated security team monitors and screens each transaction, thus mitigating the risks of fraud. We manage our own treasury operation, thus allowing us to send transactions at competitive rates without extra fees. Plus, we show you live rates for over 1,000 currency pairs. Gain transparency into each transaction, including send amount, receive amount, FX rates, transfer fees, and more. Pay your recipients the way they want to get paid — quickly and directly, in local currency, sent straight to their bank account or available for cash pickup. Pay your recipients the way they want to get paid — directly into their local bank account in their currency — without hidden fees. Recipients receive real-time SMS and email notifications upon arrival of funds and 24/7 multilingual customer support. Provide same-day or next-day payouts via direct deposits to a recipient’s bank or convenient cash pickup locations. Save on global payout costs with higher exchange rates and lower fees compared with traditional payout solutions. Our liquidity management expertise, direct partnerships, and over 8 billion USD in purchasing power help us maximize your savings. See live FX rates, so you know the guaranteed payout amounts before completing your transfer. Avoid extra intermediary fees by eliminating the middlemen. Unlike bank wires, eWallets, or prepaid cards that slow the payout process and add fees, Transpay manages its own treasury operation and has direct relationships with banks worldwide. This allows us to eliminate hidden markups, volatile FX rates, high transfer fees, and correspondent bank charges. Send payouts to over 200 countries, including markets with challenging regulatory requirements. Gain access to hundreds of currency pairs, including 13 settlement currencies and over 60 payout currency options. Throughout integration, a dedicated Transpay integration specialist works closely with you and your development team. Once underway, account managers support project planning and quarterly business optimization reviews. Multilingual customer service is available 24/7. Technical support and customized training are also available. Rest easy knowing your cross-border transactions are protected and comply with global regulatory requirements. We screen against over 100 fraud attributes and monitor each transaction from beginning to end. Transpay has licenses in over 100 jurisdictions internationally, including markets with challenging regulations. Who Uses Transpay to Send Payouts? 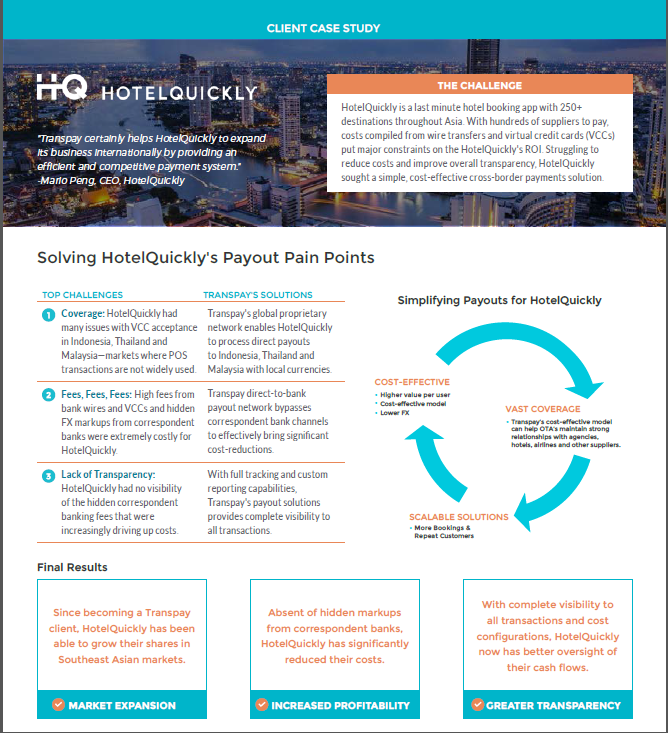 Learn how Transpay helped HotelQuickly to expand quickly and reduce costs. Transpay is a service from WyndPay, a leading global payments company with more than 30 years of operating history, processing over 8 billion USD in annual payment volumes, with over 700 employees headquartered in New York City and with offices in Mexico, India, UAE and the Philippines, among other locations. For more information, visit wyndpay.global. We’ve built a global payout partner network consisting of direct relationships with hundreds of banks and financial institutions across over 200 countries, enabling us to securely, quickly and efficiently make local bank transfers to billions of consumer and business bank accounts. What can the Pay by API service do for me? Transpay’s Pay by API service allows you to securely, quickly and efficiently make mass cross-border payouts directly to the bank accounts of your recipients, or available for cash pickup at local retailers, in over 200 countries. What type of businesses can use Pay by API? Pay by API is best suited for companies doing at least 1 million USD in annual cross-border payment volumes. Businesses using Pay by API include Upwork (freelancing platform), Careem (ride sharing), Hotel Tonight (hotel bookings) and many more. For companies with lower payout volumes, we offer the Pay by Web service. What countries can I make payouts to? We currently support over 200 countries across the Americas, Europe, Asia and Africa, reaching over 95% of bank accounts in these countries and in addition having over 225,000 cash pickup locations at leading retailers and financial institutions. For more details on our payout network, Contact Sales. Transaction fees are based on payout volumes and destination countries. We offer competitive exchange rates which are shown in real-time, guaranteed rates at the time of transaction. There are no other fees to either businesses or their recipients. To get a pricing quote for your business, Contact Sales. How do I get started with Pay by API? Integrating with our REST API typically takes 2-4 weeks, and we have a dedicated integration manager to support you during and after the process. To review our API documentation, please Contact Sales. Save up to 90% in payout fees.